Usually people don’t look forward to working Friday mornings, but in my case I’ve been looking forward to the last 6 Fridays more than anything else. I have always wondered what it would be like to work in the field of Communications. Thanks to the Migrant Resource Centre Tasmania’s MY (Multicultural Youth) Step to Work program, I was finally given the opportunity. Throughout my work placement, I’ve been observing, assisting and shadowing the MRC Tas Communications Officer. 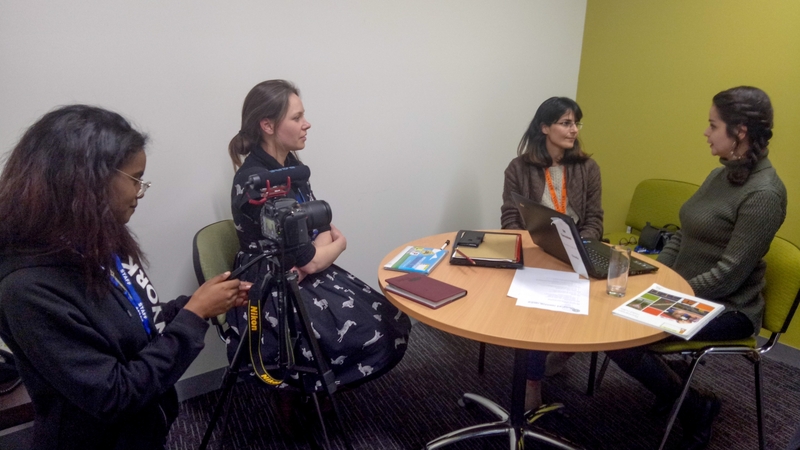 I have learned how to create content for Migrant Resource Centre Tasmania (MRC Tas) across different platforms, such as the MRC Tas website, Facebook, LinkedIn, internal newsletter, and flyers. I used different software to carry out tasks, such as Canva design software for flyers and MailChimp for newsletters. During my placement I also created my own professional account using Linkedin, and assisted my supervisor to write a media release that was later published in The Mercury Newspaper. I have also had opportunities to step outside the office and accompany the Communications Officer down to the Hobart Aquatic Centre to film and photograph a MY (Multicultural Youth) Swim to Sport Underwater hockey session. My confidence and interview skills have improved immensely during my time here. I have had opportunities to practice my camera and interview skills by interviewing the MY Swim to Sport swimmers about their experiences participating in the program. I also conducted a mock interview with a counsellor from MRC Tas’ Phoenix Centre about the ‘Harmony Through Music’ program, and wrote a mock media release about it. This work experience placement has been a significant highlight for me this year and a great stepping stone into what I aspire to do. This work experience placement has been a significant highlight for me this year and a great stepping stone into what I aspire to do. The staff at MRC Tas and my wonderful supervisor have all been extremely friendly and supportive in guiding and preparing me for the future. I strongly suggest this placement to anyone that is interested in a career in Journalism and Communications. I also urge young people from refugee and migrant backgrounds to take part in the MY Step into Work Program, as I found working in such a diverse professional workplace environment helped me to feel more comfortable. If in the future, if I was to work in a non-diverse industry, I am confident that I’d be well prepared, and less worried about feeling different.